Mugabe is set to meet with the ministers in his Cabinet on the same day his party is expected to oust him in parliament. Mugabe will have a meeting in a special seating with his Cabinet ministers, the first time since the army effectively staged a coup last week Wednesday. Zanu-PF fired Mugabe and his wife Grace yesterday, paving the way for Emmerson Mnangagwa to be elected President of the party and possibly lead the party in the general elections next year. Lawmakers within Zimbabwe’s ruling party will meet to discuss extensively their options following his defiance and refusal to resign. Zimbabwean refugees in South Africa said on Monday their dismay at hearing President Robert Mugabe’s defiant televised speech in which he poured cold water on all hopes he would resign, was such that many went to bed hungry. “I was really hurt and failed to take my dinner, and so were most of my family members and other comrades. I understand, many were very confident and waiting for the right hour to ‘wine and dine’ as we bade farewell to the old man,” Janet Munakamwe of the African Diaspora Workers Network said in Pretoria. But Munakamwe said she was not totally surprised that the man who has ruled Zimbabwe for 37 years, signalled his intention to cling on to power. Early on Monday, Zimbabweans were going to work as usual, schoolchildren were in class, vendors on the streets and taxis running “as normal” in the capital Harare. Dejection seized Zimbabweans based in Gauteng, the economic hub of South Africa which many now call home after fleeing economic meltdown, political violence and unemployment. A crowd of Zimbabweans marched to the Union Buildings, which houses President Jacob Zuma’s offices in Pretoria on Saturday, demanding Mugabe’s ouster in the wake of a military take-over and mass protests in Zimbabwe. Pretoria businessman Given Masanidze said after the “successful protests”, Mugabe’s speech on Sunday evening came as a shock. “I was totally disappointed with that speech. I was expecting the president to resign following the calls by the masses of our people, and the Zimbabwe Defence Forces and the war veterans. For me, the speech felt like I was hearing news about the death of a family member,” said Masanidze. The opposition Movement for Democratic Change’s South Africa branch vowed to increase pressure on Mugabe to vacate State House in Harare. “We will continue mobilising for Mugabe to step down. We will fight Zanu PF and any of its leaders because they are part of the oppressive system which denied Zimbabweans freedom, democracy and economic development. Be it G40 or Lacoste [factions], Zanu PF must go,” said the organising secretary Trust Ndlovu. Mugabe’s ruling Zanu PF, on Sunday said it had “recalled” the ageing leader and warned that if he failed to resign by Monday noon they would start an impeachment process. The deadline came and went with no sign of compliance from Mugabe. In the capital, the army tanks that rolled into the city a week ago were still placed strategically at Mugabe’s office and other key government institutions, a clear indication that the standoff is far from over. Zimbabwe’s beleaguered President Robert Mugabe has ignored a noon deadline imposed by the governing Zanu-PF party to tender his resignation today. Zimbabwe war veterans have vowed not to leave Harare until embattled President Robert Mugabe is gone. Speaking at a press conference on Monday morning, Zimbabwe War Veterans leader Chris Mutsvangwa accused Mugabe of dragging his feet over stepping down. “It’s over for Mugabe. We want to see his back now. The emperor has no clothes,” said Mutsvangwa. He urged President Jacob Zuma, as SADC chair, to help speed up Mugabe’s exit. “Although we are happy with the efforts of President Zuma, the AU and UN must join in sadc in getting Mugabe to leave,” said the war veterans leader. The tough talking liberation movement has set also set the legal process to force out the Zimbabwe leader that would culminate in a possible and humiliating impeachment for the elderly statesman. “He admitted to dereliction of duty during that none event announcement of his on national television last night. You all heard him. As a result we are going to file court papers seeking his removal,” said Mutsvangwa. It is not the only pressure the war vets are applying on Mugabe to go. They have called on the masses to return to the streets. “This is a Zimbabwe initiative, all Zimbabweans must unite. It is not the job of the military to remove Mugabe, but that of the people,” he said. Mutsvangwa again took a swipe at Grace Mugabe when questioned about the legality of Zanu PF firing Mugabe’s key allies. “She wanted to capture the State House courtesy of a marriage certificate. That cannot be. That process was above board”. 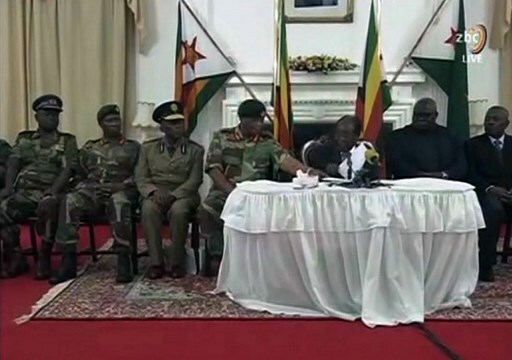 The press conference took place as the count down to the Zanu PF midday deadline for Mugabe to step down inched closer. It remains to be seen whether the party will begin the impeachment process if Mugabe ignores their ultimatum. The much awaited announcement by Mugabe on national television on Sunday night was met with confusion and anger when the Zimbabwe head of state dug in his heels and refused to resign as widely predicted. Mugabe, to the disbelief of many, even went so far as to say that he will oversee the ruling Zanu PF December congress despite the party sacking him as its leader earlier in the day. Early on Monday – the morning after beleaguered 93-year-old President Robert Mugabe shattered the expectations of millions by not announcing his much anticipated resignation – ordinary Zimbabweans were going to work, schoolchildren were in class, vendors on the streets and taxis running “as normal” in the capital Harare. It all appears generally peaceful. Mugabe’s Zanu PF, on Sunday said it had “recalled” the ageing leader and warned that if he failed to resign by Monday noon they would trigger impeachment procedures. the standoff is far from over. They rolled into the city a week ago. Mugabe himself is still “confined” at his private residence with his wife, Grace, who has also been removed from her position as leader of the Zanu PF Women’s League and fired from the party. 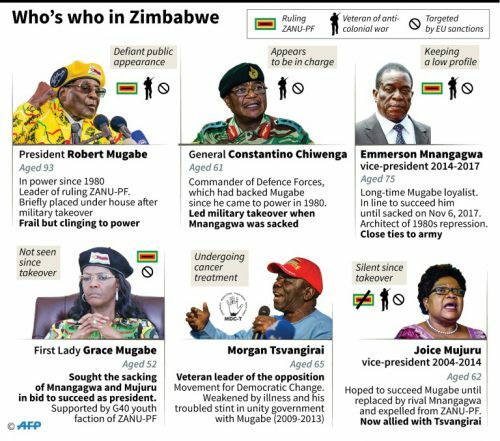 Stung by the failure by Mugabe to announce his resignation during his press conference on Sunday night, the war veterans and and opposition are not waiting and are piling on the pressure for him to step. They also intend to impeach Mugabe. Mugabe’s long and rambling speech ignored his removal as Zanu PF leader and spoke of unity and how he would preside over the party’s congress next month. Shortly after engineering Mugabe’s sacking from Zanu PF and that of his wife Grace, the war veterans said they will hold a press conference of their own on Monday morning. They have reinstated sacked deputy president, Emmerson Mnangagwa, as the interim leader PF. 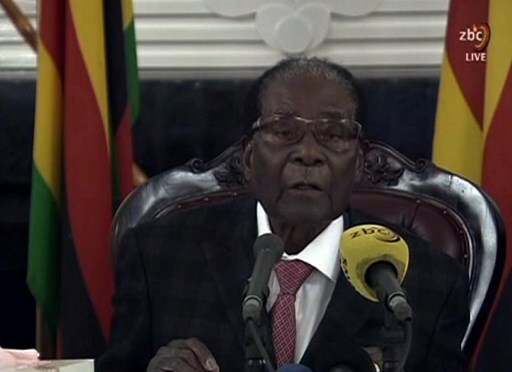 The much awaited announcement by President Robert Mugabe on national television on Sunday night was met with confusion and anger when the Zimbabwe head of state dug in his heels and refused to resign as widely predicted. The shocking turn of events which came after his party recalled him earlier in the day now sets in motion the likelihood of a humiliating impeachment that the 93-year-old now faces on Tuesday when Parliament sits. Zanu PF have given the Mugabe until midday Monday to step down or face impeachment through the Parliament. Disappointed War Veterans leader Chris Mutsvangwa said they would go ahead with plans to remove Mugabe. “He seems to be blind and oblivious to what his party wants. We are going with our plans to get people to finish what we started,” Mutsvangwa said late Sunday night. They insisted this was not a military coup, but rather an operation to root out “criminals around (Mugabe) who are committing crimes”. That was seen as a reference to supporters of the highly ambitious first lady. ALSO READ: Was Zimbabwe coup for the people?